Today, July 7, is the day that page 6 goes up, which is something I’m extremely excited about. I mentioned before that most of the concepts for The Electric Team were created by Abby, my six-year-old daughter. For the first few pages, that mainly meant just place names. But now, on page six, you begin to see Abby’s vision truly come to life. By which I mean there are unicorns. Not as any sort of joke or reference or ironic statement, but because Abby genuinely loves unicorns. At first, when Abby came up with this idea–the girl raised by unicorns–I resisted it. Couldn’t she be raised by, like, robots, or mutants, or something? Abby soon won me over, though, and it was thinking about this scene that made the whole story come to life for me. 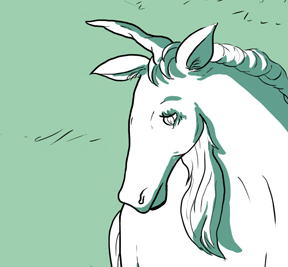 You’ll see the unicorns again on Thursday, when page 7 goes up. I added a new page called The Cast to give background on, as you might expect, the cast of characters. However, we’re still in the prologue phase of the story, and most of the cast has not been introduced yet. So the page is fairly cryptic. Still, there are some tidbits of information, and it will give you a taste of what’s coming. If case you were wondering, the prologue portion of our story is going to run through page 8; on page 9, you’ll meet the full Electric Team. Don’t worry, everything will be perfectly clear soon. Our goal is to update twice a week, on Tuesdays and Thursday. Page 5 is going up tomorrow, on July 2nd. We’ll see you back here then. Hello, reader! My name is Leighton Connor, and I’m the co-creator of The Electric Team. Since this is the first post in the Electric Team blog, I should probably tell you who I am and how this comic came to be. I’ll try to make it quick. I am a happily married father of two who lives in Ohio. In my day job, I’m a high school English teacher. Now it’s summer, though, so I have a few months to devote to my greatest passion (aside from my loving family, of course), namely comics. I’ve been a comics fan since I was six, when I found an Archie Christian comic at the grocery store. By the time I got my second comic book, Batman #340 (Batman Battles the Mole! ), I was ready and eager to begin a life-long obsession. But we’re not here to talk about Batman. 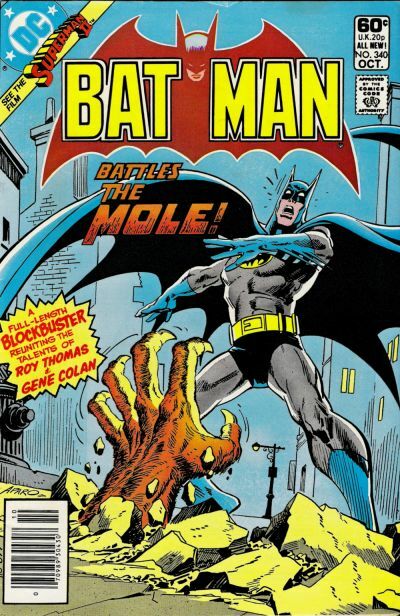 This is the internet; there are a million places to talk about Batman. Let’s leave my childhood behind and jump ahead to the 2013 Cincinnati Comicon. I took my daughter Abby, who at the time was five, for an afternoon at the con. We wandered around, took in the sights, and talked to various artists. We bought a sketch from Katie Cook. Eventually we ended up at a booth that sold used toys. For a low, low, price, we got three beat-up action figures from the 80s. When we got home we sat down to play with those new-to-us toys. We’d already cast the various toys at home into different roles, so I was curious if these newcomers were going to be good guys or bad guys. Abby told me that they were a team, called The Electric Team, and they were good guys, and they lived on another world. I thought that sounded great. We went from there and, over the following months, as we played with the original three toys, and introduced new ones into the mix, the Electric Team mythology evolved and expanded. At some point I started to think it might be fun to make an Electric Team comic. This in itself is nothing unusual, since I fantasize every day about making all kinds of different comics. But one day, while Abby and I were at the playground, it clicked in my head–I knew exactly how the Electric Team comic should start. I talked to Abby about it, and we figured out the opening story. It wasn’t nostalgia, and it wasn’t just a desire to collaborate with my daughter (though I have always enjoyed collaborating with my daughter)–I had found a personal connection with the material, and I really wanted to write this story. Abby’s not yet up to the task of writing a script, so in the summer of 2014 (I’m a teacher, remember; summer’s the magic time) I wrote the script for that 26 page story. Abby contributed ideas and most of the place names. Though I was happy with the script, I didn’t know who would draw it. Fortunately, my loving wife Alice suggested I ask Samantha Albert if she would be interested. I did, Sam was intrigued, and she started emailing me drawings. Her drawings quickly convinced me she was the right choice for the job. She’s been working hard, these last few months, bringing these pages to life, and I’m super-excited by what she’s doing. So now we’re here, sharing the comic with you, world. Let us know what you think.